Recently I wrote a piece for the Torontoist site “TTC Budget Woes Deepen” to give an overview of the major issues facing the TTC and the City of Toronto as it goes into the annual round of budget talks facing a huge mound of transit spending. This article is rather long, and is intended to go into more detail for readers who want to know how the budget works, and how the various reports and tables fit together. Some of the information is not presented in the same format in each report, and this can be confusing even to a veteran budget reader. There are valid reasons for this, in some cases, because different information is excerpted to tell different parts of the overall story. Where this happens, I will try to sort out the numbers. New projects that are not in the base, but which are shown in the chart of funding sources as a contribution to the shortfall ($1.05 billion). Changes in scope of existing projects for which there is no funding ($128 million). Additional projects that do not exist in any of the lists ($2.216 billion). Projects listed in the detailed budget, but with spending planned (if it is shown at all) beyond the 2018-2027 plan’s window. This backlog represents almost as much as the “funded” portion of the budget, and the absence of clear information on the need for, timing and priority of these projects is a huge gap in the information presented to the Commission and to Council. 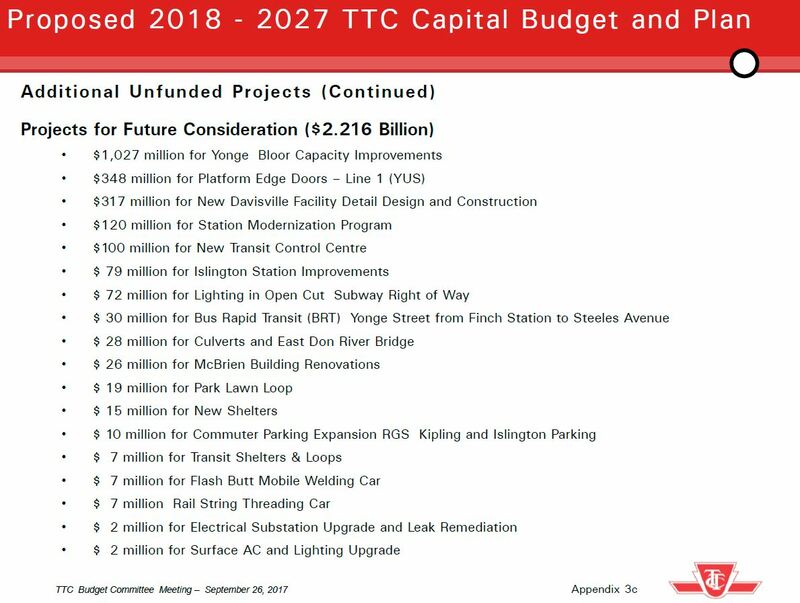 Changes in the timing of any of these projects and/or the need to move them into “funded” status will have a domino effect through the entire TTC and City budgets by bringing costs into years where funding is not now available. This list does not include any major rapid transit projects such as the Scarborough Subway (SSE), the Relief Line (RL), SmartTrack (a City project separate from the TTC’s budget) or the LRT expansions on the Waterfront West or Eglinton East (once part of the Scarborough “package”). Only the SSE has “funding” in the sense that resources from three governments are earmarked to build it, but this project could still run aground if the costs at 30% design come in higher than the current estimate. Note: In various places in this article, I quote the TTC’s responses to questions about details of the budget. These were supplied by Brad Ross, Executive Director of Corporate Communications, from TTC staff. Thanks to Brad for this. What Goes Into The Capital Budget? The Capital Budget and associated ten year plan cover ongoing replacement of assets (e.g. vehicles, equipment) and major repairs (e.g. masonry, paving, roofs, tunnels, track, electrical systems) on the transit system. Items included here have a long lifespan, commonly measured in decades. Also in the Capital Budget are new construction projects such as subways and garages. 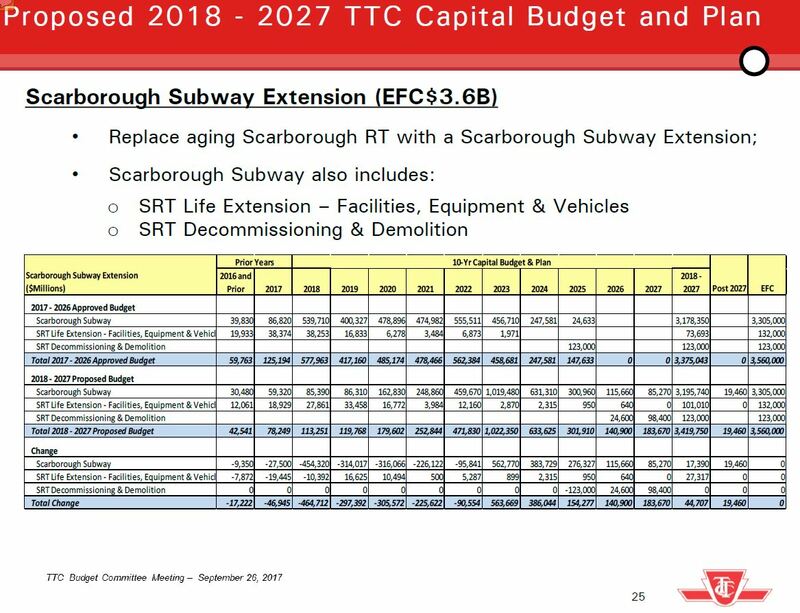 The largest of these (the Spadina and Scarborough subway extensions) have their own dedicated budgets within the overall plan. Day-to-day maintenance to keep vehicles running and maintain infrastructure in good condition comes from the Operating Budget which is not, directly, part of the Capital Budget discussions. However, decisions on whether and when to undertake capital works can affect the operating accounts both by the effect of deferred replacement (driving up day-to-day costs) and by adding to the system’s scope (more subway stations, tunnel and vehicles). Note that in all projects described in the Capital Plan, the estimates include inflation to the year in which spending would occur. Rescheduling any project will affect dollar values by reducing or adding to costs. If you buy groceries with money you earned, that is “funding”. If you pay for the groceries with your credit card, and don’t carry a zero balance, in effect borrowing in order to eat, that is “financing”. When or how you pay off this debt is another matter. If the Tooth Fairy leaves money under your pillow, that too is “funding”, although you cannot count on this forever. If the Tooth Fairy is running low on cash and has to borrow to keep paying you, that is “financing” to her, but “funding” to you. This is the situation with provincial subsidies for large construction projects. 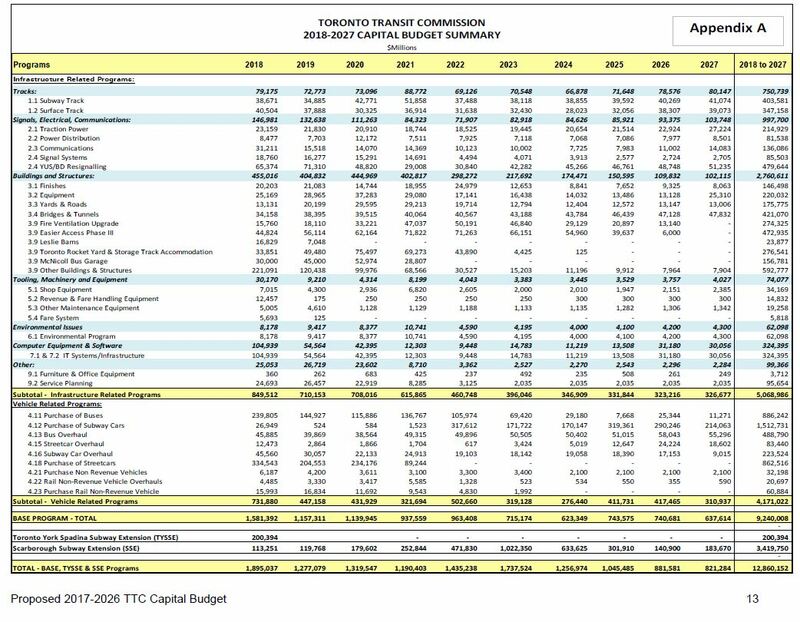 Some of the money the TTC receives comes from current revenues either at the City (property taxes and other fees) or other governments (gas tax), but much comes from borrowing at all levels. The City of Toronto keeps track of the debt it has issued on behalf of the TTC, and occasionally mentions the ongoing interest and repayment costs to illustrate the size of this hidden subsidy. In the case of provincial and federal subsidies, these may come from current revenue or from general borrowing, but the interest and repayment costs stay with those governments within the overall public debt. Projects undertaken by Metrolinx that are carried on its books, not by the TTC (e.g. Eglinton Crosstown). Carry Forward: This includes the unspent portion of line items that were planned for 2017 but will not complete by year-end either through delay, or because they have been rescheduled into the new year. Change to Existing Projects: This shows the degree to which already-approved items have increased in cost relative to projections in the previous budget. Part of this is the addition of the 2027 spending year (the 2017 budget only ran to 2026), but a great deal lies in overall cost increases, a very substantial part of the total. I will turn to this in more detail later. New Projects: These are net additions to the budget for projects that have not yet been approved by Council. The gross value of the ten year plan is now $10.29 billion, and this is “front end loaded” in the sense that spending in 2018-2022 is at a higher annual rate than in 2023-2027. There is a good chance that this indicates considerable future expenses are not yet in the proposed budget, and they show up in off-budget lists I will discuss later. 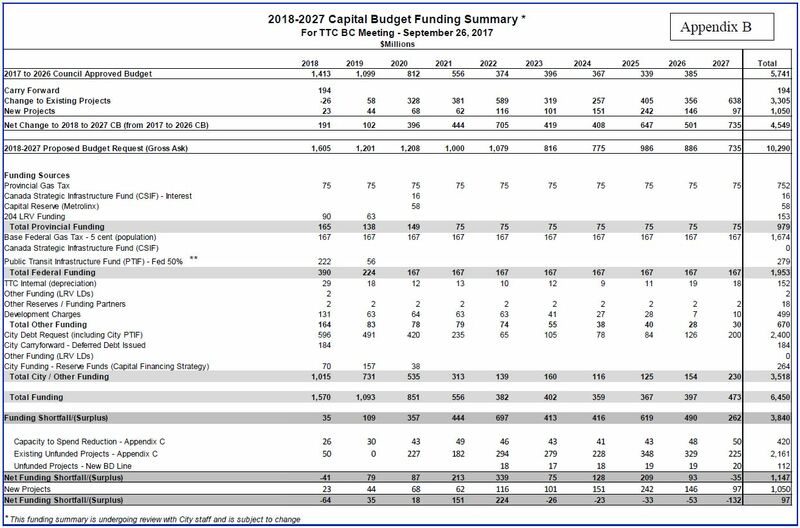 The provincial funding sources for the Base Capital Plan are quite limited, especially when one gets beyond the next few years. The only ongoing money from this source is the $75 million annually taken from provincial gas tax. Toronto receives more (about $160 million annually) but dedicates the remainder to the Operating Budget. Federal funding comes from two sources, the gas tax and the Public Transit Infrastructure Fund (PTIF). Note that, like the provincial gas tax revenue, there is no indexing of the gas tax paid to Toronto and it declines in real value over time. The PTIF funding shown here is only for Phase 1 of that program because the details of Phase 2 have not yet been worked out. Phase 1 involves work that must be completed by March 31, 2019, and this limits the types of infrastructure project that qualify. For this reason, a large amount of PTIF has been dedicated to buying new buses that can be delivered within the timeline. The details of which projects will receive Phase 2 money have not yet been worked out, but there is a good chance that this will go substantially to major projects such as rapid transit construction and renewal for which no funding (or even approval) exists today. Moreover, Phase 2 money may wind up being spent on non-TTC projects such as SmartTrack, or on non-transit agencies such as Toronto Housing. This is not a bottomless well, and it will run dry long before all of the hoped-for benefits are satisfied. TTC Depreciation: Some assets are purchased by the TTC as capital items, but not treated as such by the City because of their relatively short lifespan (e.g. IT infrastructure such as computers). The TTC pays for these out of its own working capital and then depreciates them as an operating expense over their useful lives. Late delivery charges for LRVs: The amount of money identified in the plan is, at this point, quite small. This may be deliberate pending resolution of claims against Bombardier. Other reserves/funding partners: Funding from any other source (e.g. Waterfront Toronto). Development Charges: All new developments pay a fee on a per unit (residential) or floorspace (commercial) basis to offset some of the cost of municipal infrastructure required to serve the new buildings. The formula for calculating this is dictated by the province, and the City establishes new unit values for these charges every five years. They cannot arbitrarily increase DCs simply because they need more money, only if there is a new capital project to justify this. Although the values shown in later years are low, these will likely increase in future plans as the likely amount of development in this period becomes known. City Debt: This shows the amount of debt required from the City to fund its share of the plan. Note that PTIF is a shared cost program, and so any PTIF federal money must be matched by City contributions. City Capital Financing Strategy: This is a short term plan involving the sale of surplus City assets. For a few years, this will help to underwrite TTC capital needs, but this is not a long-term funding source. 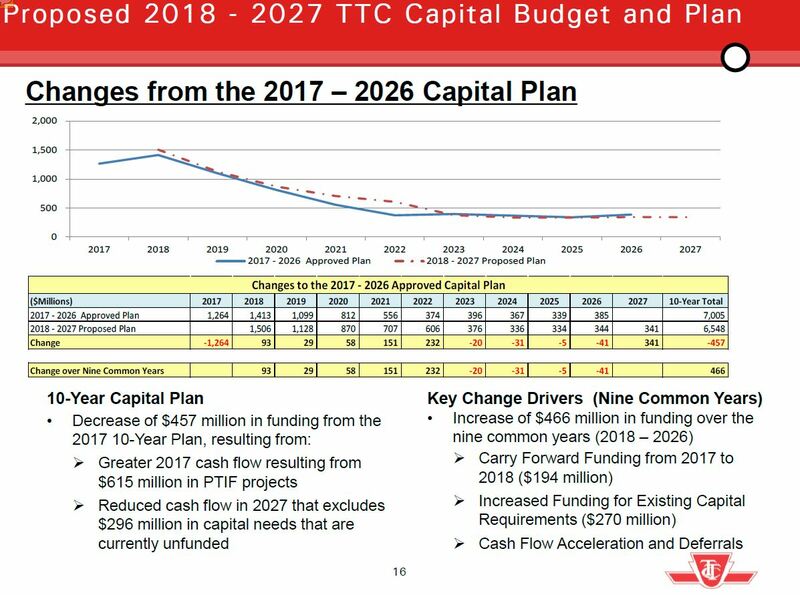 The total of City funding drops precipitously from 2018 to the 2020s, and without major new funding sources, the level of capital spending now seen on the TTC will grind to a halt. Delete $420 million under the rubric “ability to spend” on the basis that the TTC will never actually spend all of the money it has allocated in every project. Flag $2.181 billion in projects as “unfunded” (this list has been carried forward from previous years). Flag $1.05 billion as “unfunded” new projects. This leaves a balance of $97 million which the TTC presumes will be sorted out by the time the budget is finalized. The huge problem, however, will be the roughly $3.4 billion of “unfunded” projects, not to mention another list of projects that are not even yet officially part of the ten-year plan. Of particular note here is the City’s debt target which limits total servicing costs to 15% of tax revenues over a ten year average. (Provincial law requires that this value stay below 25%, but Toronto sets a more conservative cap on itself as a show of fiscal probity and to obtain a favourable credit rating.) Large City projects now underway have pushed the future debt to a level where there is no headroom for additional funding. Any new transit capital will have to come from more generous subsidies, from uploading of transit costs to the province (without an offsetting chargeback), or from additional dedicated tax revenue such as the Scarborough Subway tax (now at 1.6%). Phase 2 of PTIF brings its own problems if it is used to pay for items that are not currently funded with City dollars. For example, purchasing a new fleet of subway trains for Line 2 BD is “unfunded”. If Ottawa agrees to kick in half of the cost, the other half is a net new requirement for City funding, but there is no borrowing headroom to accommodate this. The TTC reduces its projected capital funding request by an amount that is supposed to estimate monies that would not actually be spent in each budget year. This is summarized for all affected projects in the following table. The notes here are telling in that the capital needs do not go down, but are simply “aligned” with annual projected cash flows. The problem here is that the reduction for 2018 may well turn into a carry over into 2019, or an increased future budget cost for work that has been postponed, not cancelled. The only real “capacity to spend” savings over the long haul should be actual underspending on projects versus budgets, and actual cancellation of work that is no longer required. Claiming that each year’s timing variance can be summed into a $420.5 million saving over the ten year plan is creative accounting. Note that this list only includes funded projects because only these have approved spending which the “saving” will partly offset if one believes in this methodology. Opening a major new part of the transit system can add to operating costs because new service has higher costs than what it replaced. The TTC estimates that opening the Spadina extension will add $30 million in new operating costs net of any additional fares from new riders. This is the net cost of improving service to the Spadina corridor and is as much part of the “investment” in transit as the construction budget, but the two are rarely discussed together. Historically, a large portion of the Capital Budget came from provincial subsidies with occasional contributions at the federal level. This tended to make capital projects attractive as being funded with “free money”. Operating subsidies were also more generous, including occasional special subsidies to tide the TTC over startup costs of major additions to the network. This is no longer the case, and future operating budgets face considerable pressure from sudden increases in total system costs as new projects come on line. This is also true for infrastructure built by Metrolinx within Toronto where an as-yet undetermined fee will be charged to Toronto for the cost of these lines (e.g. Eglinton Crosstown, Finch West). Another way the Operating Budget can be influenced by Capital Decisions is a recently-proposed concept that any “efficiency” an investment might bring would be used to finance the cost of the associated asset. For example, if a new bus is more fuel efficient, but also more expensive, the fuel saving could be used to finance borrowing for the vehicle purchase. However, the effect is to shift capital costs into the operating accounts and drive up the need for more subsidy, higher fares, or constraints in service growth. In theory, the “efficiency” would not have occurred without the capital investment, but the effect is for efficiencies to be invested in more expensive infrastructure rather than in better service or lower fares. Fuel consumption is an operating cost, and keeping it under control is an ongoing concern for the TTC. However, the saving offered by new vehicles might be used to offset extra costs, not to reduce operating subsidy requirements. This is the budgetary equivalent of Three Card Monte. 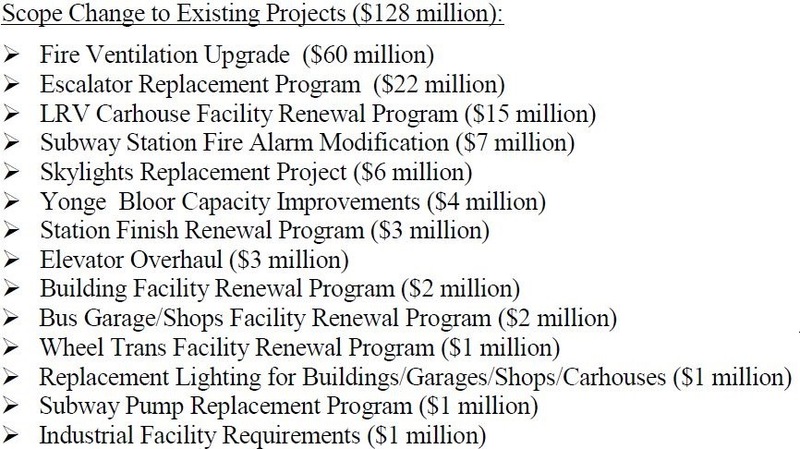 The Budget Committee Report is somewhat misleading at pages 1 and 2 because it shows the total requirement as only $9.24 billion because the “New Projects” line is not included. By contrast, Appendix B showing the funding sources (above) includes this number. This understates the apparent requirement for funding even though many items in the “New Projects” list are demonstrably required by the TTC. A further issue is raised by the fact that the presentation to the Budget Committee included an expensive list of possible future projects (over $2 billion) which is not included in the main budget report. An ongoing problem with City financial planning has always been that projects appear out of thin air in TTC capital plans, and they can go from “nice to have” to “need it yesterday” in very short order. 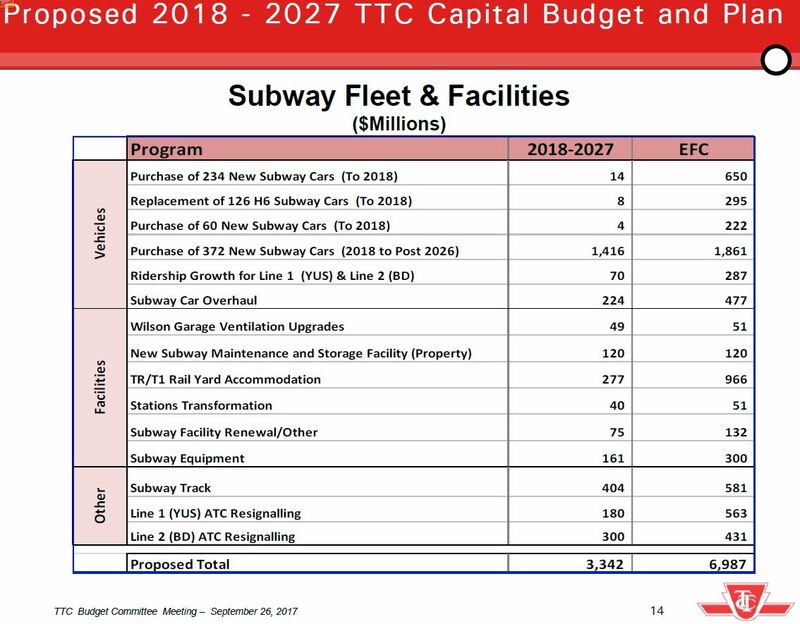 The largest items on this list are for purchases of new vehicles, notably a replacement fleet for the T1 trains now operating on Line 2 BD, and additional streetcars for capacity growth and possible new service on the waterfront. These are all over and above the $9 billion in the “base budget”, but they can hardly be called optional especially for vehicle replacement and upgrading of worn out facilities. Q: There does not appear to be any provision for a bus garage beyond McNicoll now in progress although there are plans to buy more buses (deferred project list on p11 of the main report). Are all of these buses replacements, or are there any net new? A: The deferred project list includes growth and replacement buses. Q: There is an unfunded $93 million project for renewal of Davenport Garage. I cannot imagine that this is for bus operations. Is it for some other use such as repatriation/centralization of existing functions now housed elsewhere? A: The $93 million for Davenport Garage Renewal is not an unfunded project. This item is on the list of projects identified for future consideration and funding approval has not been requested of the Commission. The question clearly was not answered, but instead the TTC engaged in the sophistry of saying this was not an “unfunded” project. In other words, a proposed project is not really “unfunded” until they put it in the budget, even though it might be required in the long run. What the $93 million is intended to buy goes unanswered. The Warden Station project would involve replacement of the current bus bay structure (which cannot be made accessible at a reasonable cost) with a new island platform terminal. A comparable project for Islington Station shows up in a later list, the fourth of this series. This list is quite daunting because of the total value, but many of these projects need to be put into context. For example, the $1.027 billion Yonge Bloor capacity project’s scope could be substantially affected by changes in GO Transit, SmartTrack, the Relief Line and TTC/GO fare integration. A project on this scale has appeared from time to time in past capital plans, but the scope harks back to an era when the TTC considered the RL as a project not worth building. They have changed their tune a lot in recent years on that subject without updating the evaluation of related projects. Similarly, it is unclear what a “BRT” project on Yonge north of Finch Station would amount to in light of plans for a Richmond Hill subway extension which is itself dependent on the added capacity the RL will provide for north-south travel. Some of these proposals are clearly to deal with end-of-life situations where project deferral really is not an option. 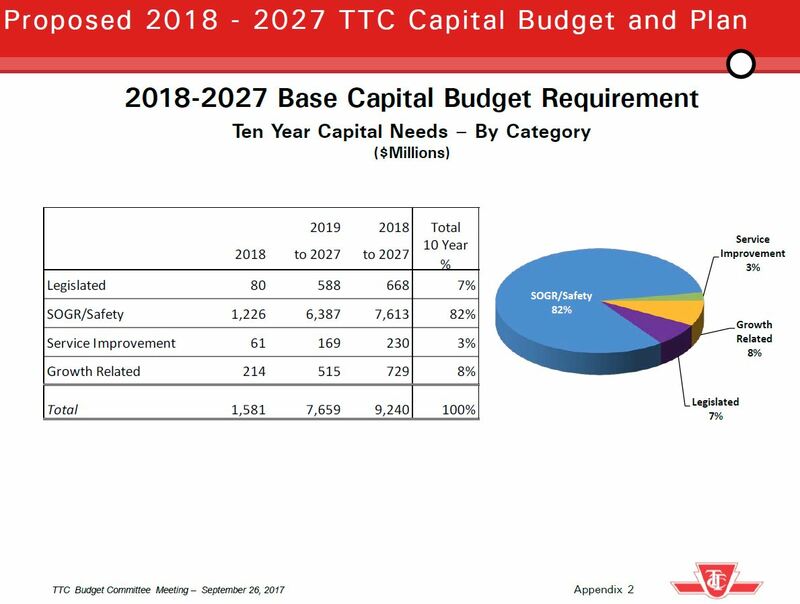 Burying them on a last-minute addition to the capital budget presentation is hardly the way to encourage a full debate on the scope of TTC capital needs and the risk exposures if these projects continue to go unfunded. Some line items have projected spending in the “post 2027” column and this is not included in the ten year plan. However, the actual timing of the projects could well be sooner than expected (a notable case is the need for a new subway yard), and this will move spending and its associated funding into years where there is already a shortfall. In some cases, previous year plans did not even show spending beyond the end of the plan’s window, and this begs the question of what other potential costs have not been included but which might arise if the project timings change. Several years ago, under the David Gunn era at the TTC, the capital plans were broken down into four major blocks with “State of Good Repair” having a high priority falling only below legislated requirements such as AODA changes. This was a direct response to the Russell Hill subway crash. Over the ensuing years, the distinction between these blocks has become less meaningful as the “SOGR” proportion has grown to crowd out other project types. With so much of the budget falling into “SOGR”, there is little to prioritize using this scheme. As with other charts that consolidate the entire budget, we do not see how much of each slice is funded. A further problem is that this chart does not show the $1 billion in new projects, nor the scope changes for existing projects, nor the potential add-ons or the major rapid transit projects. If these were included, the sizes of these slices would be quite different, and one might question why some SOGR goes unfunded while expansion steams ahead on projects with political support. The following chart compares the ten year request in the 2017 plan to the one proposed for 2018-27. The values shown here are for the “funded” portion of the budget, not for the overall plan. While there may be a decrease over the long haul, this is less a matter of “good news” than an indication that various funding sources are running dry. This section of the presentation is silent on major projects such as the Relief Line, Waterfront or Eglinton East LRTs whose timing, scope and funding are still a mystery. The TYSSE is nearing completion in advance of revenue service in December 2017, but the project will continue to draw on its funding through 2018 with claims settlements and closeout costs. The SSE budget is still in an early state, and will be updated in late 2018 when design work reaches the 30% level. Few expect that the costs shown here will hold, and any increase is likely to be on the City’s dime with no further provincial or federal contributions. Note that spending on this project continues beyond opening date both for the second phase of the STC bus terminal’s construction and for the decommissioning of the SRT. The timing of this project does not align with various parts of the Bloor-Danforth subway renewal plan that are scattered throughout the budget (further details below). 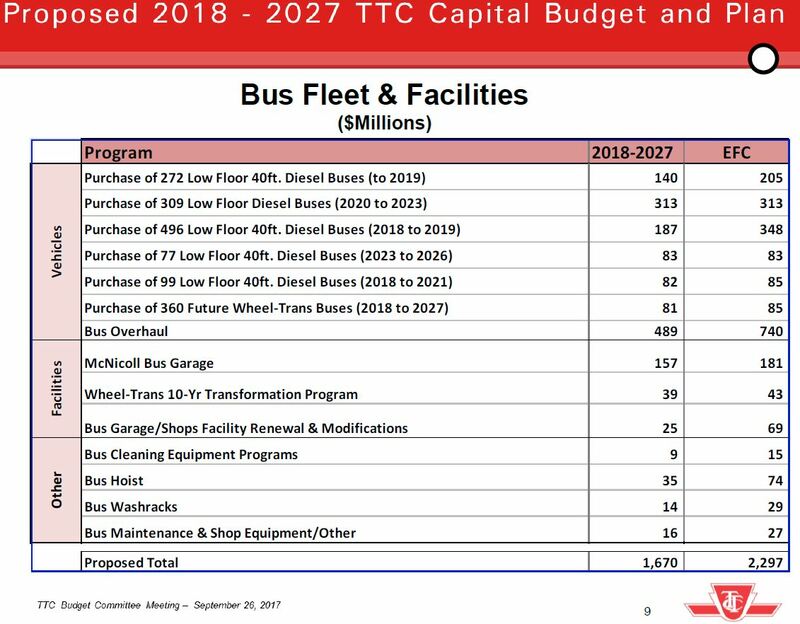 An updated fleet plan is supposed to come before the TTC Board sometime this fall, and it will be an essential part of any Ridership Growth Strategy (itself now anticipated for the November Board meeting). The fleet plan presented with the Budget assumes a minimal-growth scenario. Although the TYSSE opening in December 2017 will result in substantial changes to bus service in north central Toronto, the total requirement for buses in 2018 continues to rise over 2017, although there is no planned bump in 2019. This has quite serious implications for the system’s ability to absorb any ridership growth. 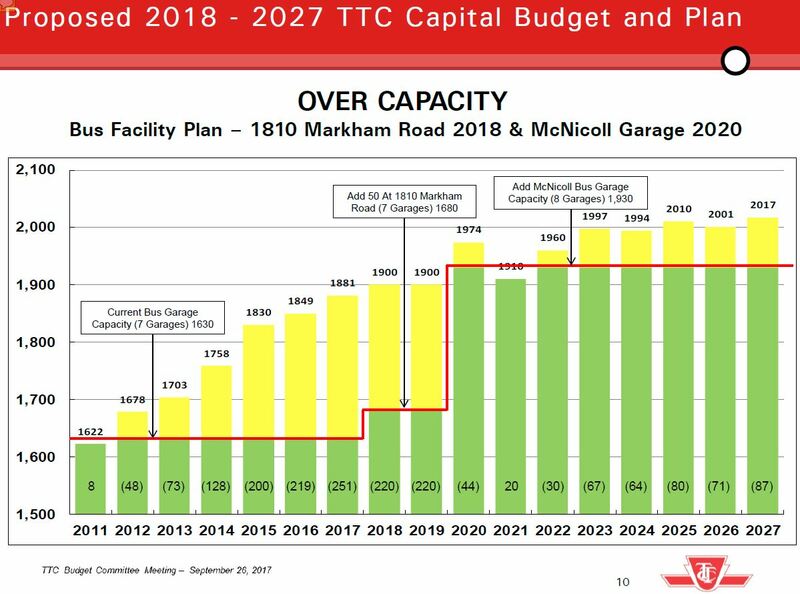 There are clearly plans for some additional service in 2020 when McNicoll Garage will expand overall storage and maintenance capacity, followed by a drop in 2021 due to the Eglinton Crosstown LRT opening. There is some provision for growth thereafter, but again the total fleet plateaus in the mid 2020s. The plan does not contemplate any garage beyond McNicoll, and yet peak service improvements from a Ridership Growth program could be limited by available space well into the next decade. The current shortfall arises from delay in starting the McNicoll project during Mayor Ford’s term as a cost saving measure. The budget is subdivided into major groups of projects that, to a great extent, reflect the organizational structure of the TTC. For all projects, any spending for 2027 is “new” because this year was not part of the 2017-26 budget. When the amount is in line with previous years for an ongoing project like track repairs, this is perfectly normal. However, when there is a sudden jump in this type of project, or when a supposedly “finite” project suddenly goes up in total estimated cost, this is cause to look deeper for possible scope creep. 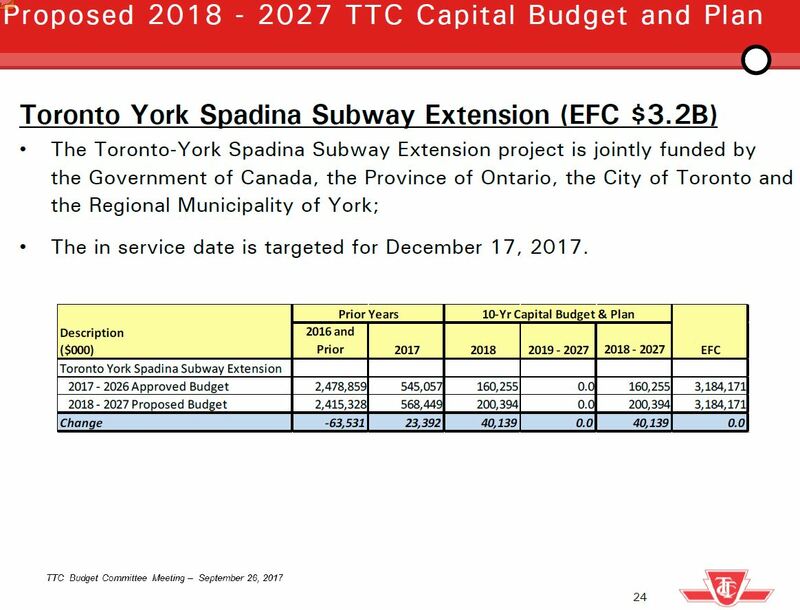 The column “EFC” is “Estimated Final Cost”, but this can be misleading for ongoing projects that never have an “end” such as the annual track replacements on the surface and subway networks. Where a project does have an end, the EFC is the total projected cost to completion. 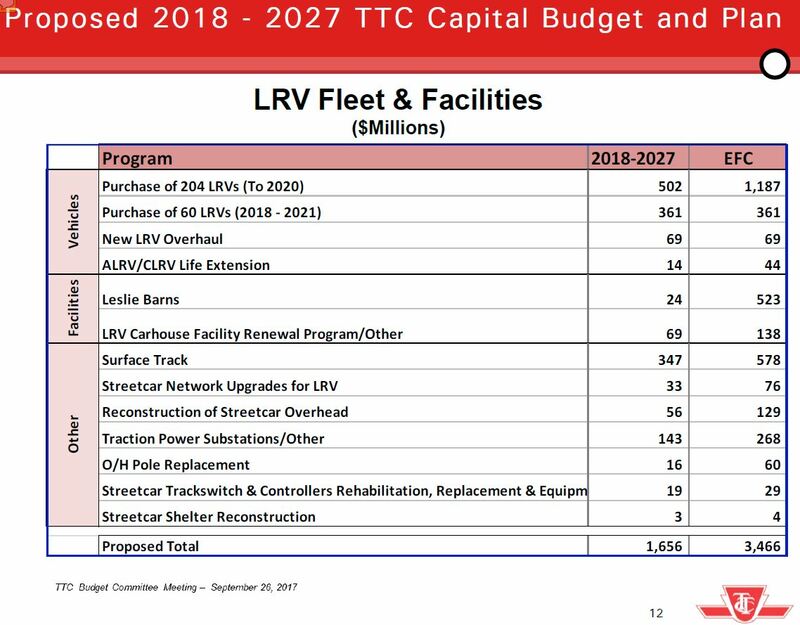 In the cases shown here, the Capacity to Spend reductions included in the 2017-26 plan have been zeroed out for 2018-27 because, like vehicle purchases, track maintenance must happen and “savings” in individual years are a question of timing, not of an overall reduction. In other parts of the budget, CTS reductions remain as a partial offset to planned spending. The East Bayfront LRT now has a post 2027 cost estimate of $490m whereas previous plans only included money already spent on design and the EA report. 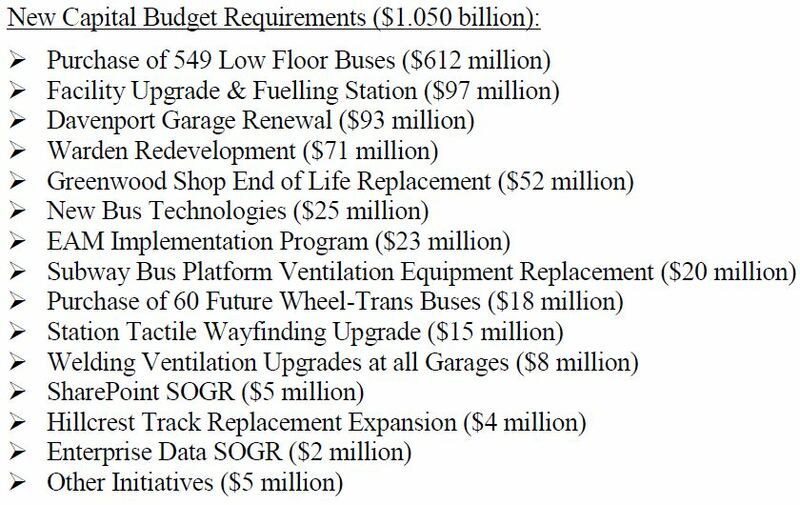 A major difficulty in reading the budget is that the TTC sprinkles related projects through several sections depending on which part of the organization does the work. Station improvements, for example, can be scattered among various accounts, and unless there is a report launching a “megaproject” for station renewal, these accounts are rarely consolidated. These are items which will certainly be part of any renewal because they relate one way or another to the new Line 2 fleet. However, it would not be surprising to see other budget lines related to station renovation included in this megaproject as well. However, until the TTC publishes a report/proposal for this undertaking, we will not know how much additional committed funding will be required to pull it off. A further problem lies in the relationship between these projects and the Scarborough Subway and whether the SSE will be built only with ATC signalling (much like the TYSSE). If so, then much of the spending related to new trains must be complete before the extension opens. However, the current spending profiles in the line item budget extend beyond the SSE’s supposed opening date. Spending on the new yard and maintenance facility at Kipling is listed as “post 2027” even though it is required for new BD trains that will be delivered much earlier. The TTC will have to reconcile this timing problem as part of any Line 2 renewal plan. Q: There continues to be an inconsistency in the timing of various BD renewal projects with the opening of the SSE, specifically the point at which the BD fleet will be ATC capable. This is independent of the fact that various BD renewal projects are unfunded. Q: The T1 replacement project now extends beyond 2027 (p13 of the blue sheets). Q: There is a very large increase in the TR/T1 Rail Yard Accommodation project (p 10 of the blue sheets) of almost $471m in post 2027 costs. What is this for? This answer completely ignores the question of project timing and the fact that considerable spending lies beyond the supposed opening date of the SSE. If these projects must be rescheduled, then the planning for capital funding must be rejigged across the budget. The Budget Committee presentation include a summary of major pending expenses by mode for bus, streetcar and subway. 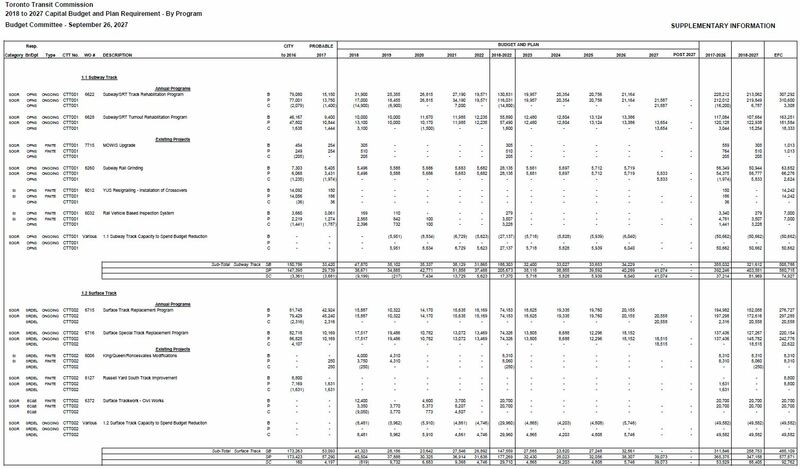 What is missing from these tables is an indication of which lines are actually funded and which are not, let alone any explanation of the problems facing the TTC and City if these projects are funded late or not at all. Moreover, there are additional proposed items which could add to the total costs but which are not included here. The result is a misleading presentation of capital needs and funding. The “EFC” values for ongoing projects such as track repair are meaningless numbers because they include costs going back well before the budget window, and will include costs in years beyond it. That is the nature of an ongoing project. By contrast, finite projects have a known cost, but the EFC numbers below could include pre-2018 or post-2027 costs depending on their timing. I was trying to figure this out from looking at the detailed budget, but it’s still unclear: do you think that the capacity-to-spend reductions for transit priority measures (WO # 6713 under section 9.2) will affect the TTC’s ability to deliver on these improvements (queue jumping, TSP, etc)? It’s also unclear what the difference is between the annual “Transit Priorities” program (WO# 6391) and Opportunities to Improve Transit Service – Transit Priority Measures (item 5) (WO# 6713). Do you happen to know the difference in scope of those two? Any light you might be able to shed on this would be much appreciated–thank you! 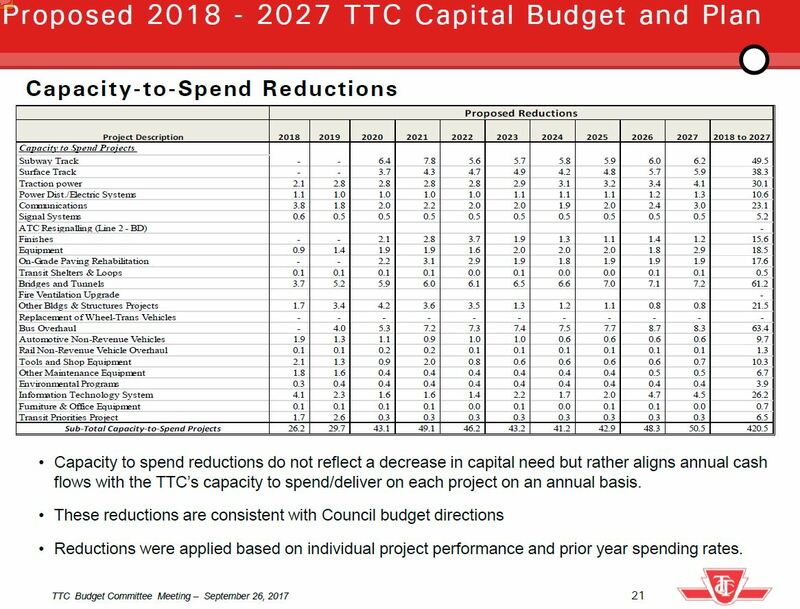 Steve: Capacity to spend refers to the fact that for some budget lines, the TTC (and other agencies) always spend less than the total budget because some work is delayed/deferred to a future budget year. The CTS adjustment avoids the City having to borrow money they don’t need because it won’t actually be spent. Some budget lines such as bus purchases have a much more definitive delivery schedule and so they have lower or no CTS reductions. Transit Priorities refers mainly to the cost of installing transit priority signalling (the TTC pays for it even though the signals are City infrastructure), and it would also fund things like queue jump lanes if any were built. Opportunities to Improve Transit Service is a basket of programs arising from TTC advocacy in the last election that was picked up by the Mayor afterwards. Item five within this is money for additional work on Transit Priorities, the same as the first line you cite. In the 2017 budget, “Transit Priorities” included $6.2 million in 2017 and $2 million in each year from 2018-2026. Opportunities (5) included $2.4 million in each of 2017-2021, plus some PTIF money in 2016-2018.